During an earthquake, the performance of non-structural building elements may significantly impact the level of risk posed to building occupants, both directly and indirectly. 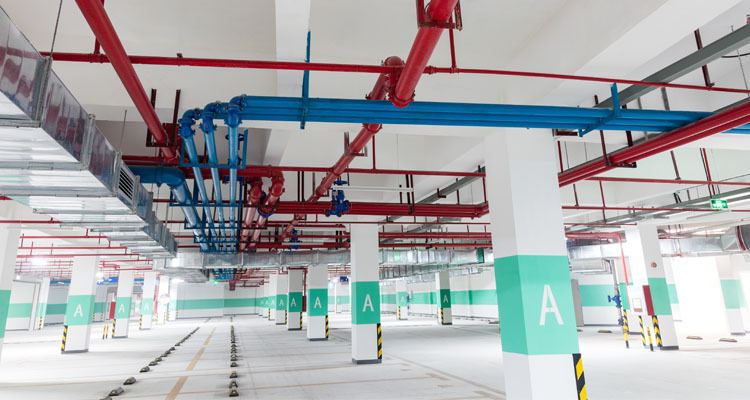 In addition to potentially causing injury through collapse, poorly or unrestrained non-structural elements can rupture pipework (which may lead to failure of a fire sprinkler system), short electrical equipment (which may start a fire) and block exit paths. The collapse of non-structural elements may also compromise the structural elements of a building, rendering the building un-occupiable and resulting in significant repair costs and lost productivity. A new and chilling video has been released warning of the anticipated "megathrust" earthquake which may strike near the eastern coast of the North Island. The first Hikurangi Response Plan educational video features practical tips on how to better prepare for a large earthquake and tsunami. The four-minute clip has been prepared by East Coast LAB (Life at the Boundary), a programme trying to educate the public, especially those living on the coast near the Hikurangi plate boundary. It warns New Zealand sits on a subduction zone similar to Japan, and people should be prepared for the next large earthquake and tsunami. The team at TRACKLOK® have been working hard in the USA for the last two years testing our products to achieve ICC accreditation – no small feat! We are close to achieving this goal. As part of this process we have been required to change the material TRACKLOK® products are made from. We have complied and will be making TRACKLOK® in steel going forward. 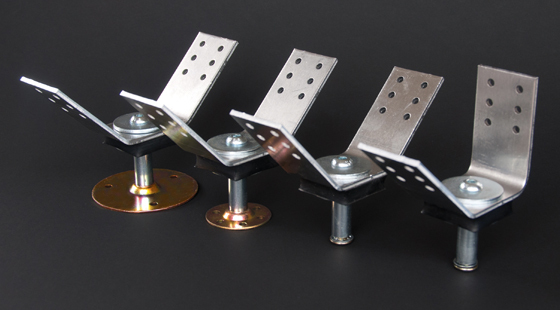 We have also tested with a reduced number of screws in the fly plate and top connectors of TRACKLOK®, TRACKLOK® RETRO and TRACKLOK® TIMBA. This has been a success. The “new” TRACKLOK® products will only require 4 x 10-gauge wafer tek screws in each connection point to the steel stud, reducing the amount of screws required to brace! We will run out the aluminium stock and steel will begin to filter through. Plus, we will be updating images and design guides with the new look. As we do, please note that both the aluminium and the new steel versions comply to AS/NZS1170 and provide the same capacity. Contact your local TRACKLOK® distributor – they have samples and stock ready for you. The team at TRACKLOK® wish you very Happy and Prosperous New Year and welcome to 2019 - it has been an amazing summer season, complimented by fantastic weather. If it’s your first day back at work after a decent break, then lucky you! If you’ve been back at work for a while, then we hope you are enjoying the weather before and after work. All of us at TRACKLOK® have been working hard over the summer break, ensuring the availability of TRACKLOK® and GRIDLOK® products here in New Zealand and Australia. We have also been involved in a robust test program based in California, which will help us provide these great solutions to the US market. Our testing in the USA was successful and our accreditation is progressing well. One of the benefits of testing to USA codes and requirements has been to verify what we already know about the capacity and performance of TRACKLOK® and GRIDLOK®, while learning a few new things. We will have more updates about these learnings soon and we look forward to sharing them with you. In the meantime, if you or your clients have any questions please contact us and remember to take advantage of our FREE TRACKLOK® Mark Up Service. The TRACKLOK® team have had an amazing 2018 and we want to sincerely thank you all very much for making this journey possible. After two years of preparation we completed our combined ICC, OSHPD and DSA testing and look forward to the advancement of our US certification in 2019. The honour of being involved in some of New Zealand’s key projects, including Acute Services Building in Christchurch, Commercial Bay and Scentre Group in Auckland. The first Australian TRACKLOK® and GRIDLOK® projects. A humbling response to TRACKLOK® and GRIDLOK® in Australia, USA, Canada, Japan and beyond. We’ve really enjoyed working with incredible architects, brilliant engineers, talented installers and hardworking distributors from around the world. Merry Christmas and Happy New Year to you and your families – it really has been our pleasure! Really looking forward to working with you all in 2019. The end of 2018 is closing in fast and the team at TRACKLOK® are astounded at how quickly this year has zipped past! The year has been busy for all in our industry and the sheer volume of construction work means that many install teams will be working through the Christmas break! The TRACKLOK® team are working with our dedicated distributors to ensure TRACKLOK® and GRIDLOK® products are available when needed. Talk to your preferred distributor regarding your project requirements over the Christmas break to ensure you have the products you need. TRACKLOK® offices will be closed from 21st December 2018 through to 9th January 2019. If you have any questions or would like to discuss your project requirements for the Christmas and New Year break, please contact the team at TRACKLOK®. The team at TRACKLOK® have been speaking with engineers, designers and installers about creating efficiencies in bracing of non-structural walls and ceilings. It is clear there is a need for consistency. From design to consent to installation and inspection. In a response to this, TRACKLOK® offer a FREE plan mark-up service for wall bracing. Simply email your reflected ceiling plan (RCP) to us showing the part height partition walls, wall build up and location of the project. Our dedicated team will mark the TRACKLOK® positions on the plan. This marked plan along with our Bracing Guide can be lodged with the consent for the project, filed with the successful installation company and retained for use by project managers and building inspectors to ensure consistency. This is another small way in which we can make a big difference on site! Contact the team at TRACKLOK® today or simply email your wall plans and designs here. The team at TRACKLOK® have been speaking with architects and engineers around the world about the efficiency and build benefits TRACKLOK® and GRIDLOK® bring to construction. Utilizing TRACKLOK® for partition walls, allows designers to confidently bring non-fire and acoustic rated full height walls under ceiling to achieve substantial cost and labour savings. The ability for TRACKLOK® to provide pre-engineered compliance to building codes means part height partition walls are a real option to replace some full height walls. Another feature of TRACKLOK®, is the rubber dampener. This prevents the head track from twisting under seismic loads and interstory drift, avoiding plasterboard separation and achieving compliance. Additionally, GRIDLOK® rigid bracing for ceiling systems has seen a reduction in labour hours and in the number of braces required, due to the consistent capacity of GRIDLOK®. We continue to work with industry professionals to find new ways to achieve build efficiency and cost reduction while achieving maximum code compliance. Contact us to talk about your next project and please visit our website to find all the details you require for your designs. The team at TRACKLOK® continue to work hard with our New Zealand distributors and customers, helping them to build it better with the full range of TRACKLOK® and GRIDLOK® solutions. With the recent failures of construction companies and the pressure costs are having on businesses in the construction sector, we see TRACKLOK® and GRIDLOK® as great solutions that reduce consultancy fees incurred on projects. The ability to include these pre-engineered solutions, simply reduces costs. As we continue to move into Australia and The United States of America, we are seeing designers and installers looking beyond TRACKLOK® and GRIDLOK® as seismic solutions and towards the build efficiencies these products provide. Reduction in labour hours on site and the efficiency of install, combined with inherent compliance, makes TRACKLOK® for walls and GRIDLOK® for ceilings the path to working smarter, not harder. The team at TRACKLOK® have seen a strong preference of ceiling designers and installers for the GRIDLOK® rigid bracing system for ceiling systems. Traditional methods of back bracing are beginning to be viewed as inconsistent and time consuming, while providing less than ideal outcomes due to the ambiguity around cutting strength out of steel stud to form connection flanges and transitions. Download the latest New Zealand (edition 3) Bracing Guide and the Australian Bracing Guide for latest guidance. GRIDLOK® has proven capacity and a consistency in performance that appeals to designers, installers and inspectors. Feedback from the market shows the huge commercial benefits to installers of massively reduced labour content, increased flexibility of positioning and the ability to rotate the bracing footprint in order to avoid services. Also, with the increased and consistent capacity, there is always an opportunity to reduce the number of braces required when compared to less effective methods. We will continue to work with ceiling manufacturers, our distributors and ceiling contractors to ensure projects benefit from the real advantages of bracing with GRIDLOK®. If you have questions about GRIDLOK® or would like to learn more, please let us know. Also, if you have a TRACKLOK® project requiring our FREE mark up service, email through your RCP and wall build ups, we are only too happy to assist. Please bear in mind that due to increased volume of work, our team will need advanced warning of your requirements. The question of whether property owners can be held liable for earthquake losses bears heavily on Los Angeles, where officials are considering an ambitious plan to publicly identify and require retrofits of potentially dangerous buildings. Some property owners fear that assessing the seismic risks of their buildings will create legal liability in the event of a destructive quake. The team at TRACKLOK® welcomed the draft of AS/NZS2785:2018 this month, it is a real reflection of learnings in the non-structural built environment. The draft suspended ceilings standard shows how real-world advancements in design and construction become part of the building code. Once issued as an official standard, AS/NZS2785:2018 will ensure New Zealand and Australia continue to develop resilience in our building stock. First though, it is your opportunity to have your say, click here to read the draft, then formulate and submit your comments. When using steel stud to brace ceiling systems, often the legs (side walls) of the stud are removed. This leaves only the web of the steel stud as the attachment point to the ceiling system. We believe there is a fundamental flaw in this approach, which is why we developed GRIDLOK®. The structural integrity of the steel stud is removed when it's geometric shape is altered/removed – perhaps more of a focus for AS/NZS4600, but still a real concern. Also, remember our TRACKLOK® plans team are available to mark-up TRACKLOK® positions on your plans. It is a FREE service! When a catastrophic earthquake hits California, buildings will topple and potentially hundreds could be killed. But what gets less attention is the wrenching aftermath of such a huge temblor, which could leave whole neighborhoods torched by fires uninhabitable and hundreds of thousands of people without a home. Officials are grappling with where all these quake refugees would go. It is important to celebrate success and the team at TRACKLOK® have proudly been involved in many fantastic projects. In late 2014, buoyed from the success of Burwood Hospital, TRACKLOK® Ltd approached the architects and health planners for the Acute Services Building at Christchurch Hospital - Katoa Health Design - to talk about bracing solutions for the project. The TRACKLOK® solution was proposed by CPB Contractors and Jacobs Engineering as part of an alternative steel framed partition and bracing system. TRACKLOK® was established as the basis for the specific design required in this Importance Level 4 (IL4) project and allowed the project team to manage an out of plane deflection requirement of 50mm. This successful approach to IL4 projects has been replicated for the Out Patients Building adjacent to Christchurch Hospital, Hawkes Bay Hospital, Grey Base Hospital and many others. Contact TRACKLOK® to talk through bracing requirements for your next project and remember we have a great deal of experience with IL4 requirements. San Francisco in 1906. Most the damage from a Hayward Quake will affect Oakland, but fires and shaking will topple blocks in SF and Silicon Valley as well. Courtesy UC Berkeley. The US Geological Survey [USGS] took advantage of the anniversary of the 1906 San Francisco earthquake this week to update its working scenario on what may happen when the Big One hits the Bay Area again, focused not on the San Andreas fault but on its potentially more hazardous Hayward Fault neighbor to the east. The team at TRACKLOK® have been busy in the world of non-structural elements, as it is the focus in many countries. This focus was evident on our recent US trip to California, the AWCI 100th Conference, the INTEX show in Florida and the NZSEE Conference in Auckland. We have been active in New Zealand and Australia delivering our patented, pre-engineered, proprietary solutions for internal walls and ceilings. While in the United States we are working our products through the ICC process to gain US market certification – nothing proves a point like shake table testing! It’s been great to hear that the TRACKLOK® markup service has been a useful tool for designers, engineers and contractors. We encourage you to use this service to help provide clarity throughout the construction process. In addition to the New Zealand Edition and Australian Edition Bracing Guides we have produced Installation Guides for each country, which we hope you will find useful. Ask your local distributor for a hard copy. Also, if you have the need for a ceiling design or would like engineering support for your project we are happy to assist you – simply email us here. The team at TRACKLOK® have been watching the movements in the market with interest. The recent acquisition of USG Boral steel and grid products by Rondo is a game changer. We believe the market is in a rationalization and consolidation mode and this will benefit specifiers and installers with more choice. 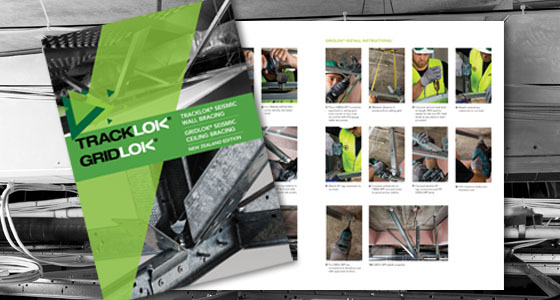 In other news, the TRACKLOK® Bracing Guide (second edition) has been well received by all, with great feedback. Get a copy from your local re-seller or email us directly and we will send you a copy immediately. Remember you can download a copy here New Zealand Edition and here for the Australian Edition. We want to thank the AWCI for the Golf days in Hauraki and Christchurch – Team TRACKLOK® took out third place in Christchurch and our team member Jordan from BVT won a Fitbit for the longest drive! Click here for photos on the LinkedIn page. The seventh anniversary of the 22 February Canterbury Earthquake will be marked with a public Civic Service at the Oi Manawa Canterbury Earthquake National Memorial site. The service will begin at 12:30pm at the Memorial site on the corner of Montreal Street and Cambridge Terrace. The service is expected to take around 45 minutes, followed by the opportunity to lay floral tributes at the Memorial Wall across the river. It will be livestreamed on the Christchurch City Council website for those who can't be there.